Over the years, they've created several standout EDC products that have been successfully funded on Kickstarter: Titanium Pocket Bit, Titanium Pocket Tool (TPT), Titanium Pocket Clip, Ti Arto, Bit Bar, and, most recently, the TPT Slide. 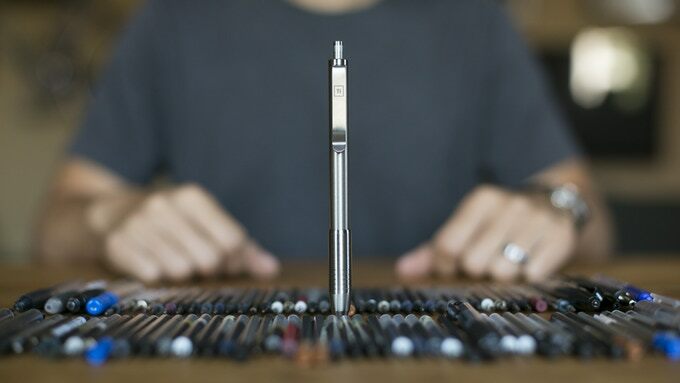 This time, they're back at it again with arguably the most clever pen design yet: Ti Click EDC. What separates Big Idea Design pens from the pack is that they work with tons of different refills. The Ti Arto, for example, works with over 200 different refills without any modifications. The new Ti Click is the first click pen to work with over 100 refills out of the box. No hacks or mods required. Like past pens from the company, the Ti Click features an all-metal construction. The outside of the pen is made of grade 5 titanium alloy (Ti-6Al-4V) and comes in three finishes: Machined Raw, DLC Black, and Stonewashed. The length of the pen adjusts between 4.64 inches (118 millimeters) and 5.11 inches (130 millimeters) to accommodate different refill sizes. It's 0.44 inches (11.3 millimeters) at the grip and weighs just under one ounce when empty, 0.92 ounces (26 grams). How it adapts to different refills is the true beauty in the engineering. Simply unscrew the grip, remove the old insert, click to activate the mechanism, insert a new refill, and screw the grip back on. That's it. No mods, hacks, or, most importantly, tip wiggle. You can view the complete list of compatible refills here. The Ti Click Kickstarte campaign launched this morning and reached its $2,000 goal in just 13 minutes. At the time of this writing, the campaign has reached $65,127 in pledges and shows no signs of slowing down. You can grab a Ti Click for $70 while the early bird pricing lasts (there are currently only 105 left out of 800). After that, the entry pledge starts at $75. Both pledge levels include on Ti Click pen, a box for the pen, Schneider Gel 0.4 black insert, and free worldwide shipping. The Ti Click is expected to ship in November 2018.